Get sweaty at Midsummer Night Swing's first event of 2010. 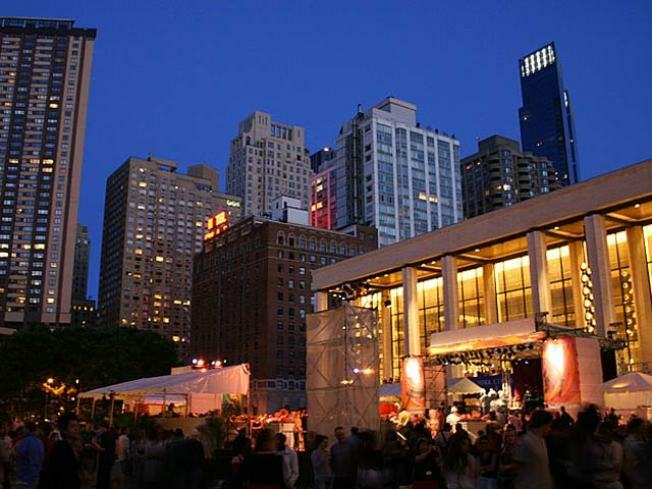 SWING LOW: LincolnCenter finally launches its 2010 season of Midsummer Night Swing tonight, pitting local bandstand legend George Gee and his Orchestra against the West Coast’s Bill Elliott Swing Orchestra in a battle of the bands that’s bound to leave hoofers sweaty on the plaza. Bring your partner and your t-straps by early (6:30PM) for a dance class. 7:30PM. PIT PARADE: Passion Pit’s benefit show at Celebrate Brooklyn! sold out about five minutes after it was announced. But! If you can’t hit up your friends for an extra ticket, let’s not forget that the Prospect Park Bandshell has terrific acoustics which waft well beyond the chain-link fence enclosing the performance space. Picnic blanket right outside the gates, anyone? 7:30PM/gates 6:30PM. RAISING THE BAR: The World Record Appreciation Society returns to Joe’s Pub with a host of new feats of strength, daring and questionable sanity, including—but not limited to—Most Gallagher VHS Tapes Smashed With a Sledgehammer in One Minute. 9:30PM.